One of the most satisfying parts of my occupation as a physician is hearing how pleased a patient is after a successful treatment. 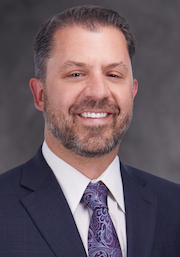 Dr. Miranda is board certified by the American Osteopathic Board of Orthopaedic Surgery and fellowship trained in adult reconstruction and arthritis surgery of the hip and knee. Dr. Miranda specializes in the direct anterior hip approach and minimally invasive surgery of the hip and knee, as well as outpatient total joint arthroplasty. He also specializes in complex revision total hip and knee arthroplasty. Dr. Miranda performs MAKO robotic hip and uni-compartmental knee replacements. Dr. Miranda serves as the director of the adult reconstruction center at Brandon Regional Hospital. As an expert in the field of orthopaedics, Dr. Miranda has delivered several presentations nationally and has received numerous awards and accolades. With a commitment to educating rising doctors, Dr. Miranda serves as an affiliate assistant professor in the Department of Orthopedics and Sports Medicine at the University of South Florida College of Medicine and as a clinical instructor in the Department of Orthopaedic Surgery at Nova Southeastern University. Dr. Miranda is a member of the American Osteopathic Academy of Orthopedics, American Academy of Orthopaedic Surgeons and American Association of Hip and Knee Surgeons and the American Osteopathic Association and Florida Orthopaedic Society. Dr. Miranda’s personal interests include spending time with his family, traveling, golfing and coaching youth soccer. Excellent surgeon and staff. I was pain free the day after surgery. I was able to get an appointment within two weeks where I would have had to wait three months before being able to get a follow-up appointment with other recommended surgeons. I am a senior citizen patient and highly recommend Dr. Miranda. Can’t say enough. Dr. Miranda is extremely patient and listens closely. I highly recommend Dr. Miranda. I did a lot of research when I realized that I needed a hip replacement surgery and I actually talked to two other surgeons before finding Dr. Miranda. There is no doubt in my mind that I picked the right surgeon! Dr. Miranda took all the time I needed to answer my questions about the surgery and recovery. He listened to me and was very kind and compassionate. I have been amazed at how quickly I am recovering. I had the surgery 6 weeks ago and am already walking 3 miles. I recently had a total hip replacement and Dr. Miranda did a fantastic job! I was up in two days walking around the hospital. My recovery was quick and I was totally shocked. I couldn’t believe I had progressed like that. The staff of Dr. Michael Miranda is great. Office Manager Amanda and P.A. Kelly keeps everything moving and takes the time to address any patient questions or concerns. Kudos to a wonderful support staff on the desk and the Doctor they work for! After having horrible pain from my hip, to my knees, to my toes that was truly affecting my life, I was referred to Dr. Miranda who immediately identified that I needed a hip replacement. This turned out to be one of the best experiences of my life. With a strong determination and being faithful with physical therapy, I was back to normal PAIN FREE living in 2-3 weeks. It’s wonderful to be myself again and have the pain GONE! I am back to my active lifestyle! I credit the expertise of Dr. Miranda and his staff for being professional and very knowledgeable from start to finish. If you were ever considering this procedure, I highly recommend you trust Dr. Miranda and his staff. There is no better and you will thank me later! I would highly recommend using Dr. Miranda if you need a total hip replacement. He recently performed one on my right hip, using the anterior approach. He also used customized artificial implant to ensure I have improved stability and flexibility. He is very skilled and makes it a point to keep up with any available improvements to offer to his patients. I am 61 years old and had surgery two months ago. I have been driving for weeks, riding a bike (stationary and traditional) and golfing! Thank you, I really appreciate your great work. Keep doing exactly what you are doing. Hopefully God will continue to help you let people recover. Thank you Dr. Miranda and your team. In the beginning of 2016, I had developed an illness which needed treatment and a strong medication. My doctors told me that the pain I was experiencing was to be expected and would go away once the medication was stopped. It did not stop and in fact, it got much worse. After several unsuccessful visits to different doctors, I decided to see if this pain I was experiencing might somehow be arthritic. I saw Dr. Miranda at Florida Orthopaedic Institute at their Brandon location. I was very impressed with the facility and the fast handling of anything that needed to be done when I met with Dr. Miranda. He informed me that my problem was arthritis and the only solution would be to have surgery done. I was suffering so much that I asked how soon could he perform the surgery. In about two weeks everything that needed to be done prior to the surgery was promptly taken care of. Dr. Miranda successfully performed the surgery and I was in the hospital one day and released the next day. My care after the surgery was excellent. As soon as I got home, I started physical therapy and I was already seeing improvement with less and less pain. I walked with a walker for only two days and no longer wanted to use as it became no longer necessary. I was so good after the surgery that I did not have to have more than a week of physical therapy. I had no pain at all after about two months and I certainly was glad I had the surgery done. If I ever have a problem with a hip or knee, I would definitely not hesitate to see Dr. Miranda to have my problem solved. I walk perfectly now and even better than I have in many years. Thank you very much Dr. Miranda! I had horrible pain from my hip, to my knees, to my toes that was truly affecting my life. After seeing many other doctors, I was referred to Dr. Miranda who immediately identified that I needed a hip replacement. Being fourty eight years old, it seemed like I was too young for this procedure and I was, of course, very hesitant. It turned out to be one of the best experiences of my life. I elected the anterior approach. With a strong determination and being faithful with physical therapy, I was back to normal, pain free living in two to three weeks. It is wonderful to be myself again and to have that pain to be GONE! I am back to my active lifestyle! I credit the expertise of Dr. Miranda and his staff for being professional and very knowledgeable from start to finish. If you were ever considering this procedure, I highly recommend you trust Dr. Miranda and his staff. There is no better and you will thank me later. For two years I was avoiding surgery on my hip. I went to the best place in town Florida Orthopaedic Institute, and they told me I needed surgery. When I inquired about the doctors available I selected Dr. Miranda. I am glad I did! I explained to him the pain not only on my hip but in my knee and back. He assured me the pain on my knee will go away after surgery and it did. The same day of surgery I walked to the bathroom, the next day I began therapy, two days later I went home, and three weeks later I could walk without a walker or cane. Thank you to God and Dr. Miranda, it has been a year without pain! I am sorry I didn’t do it sooner. In 2016, I received 2 knee replacements. One in September, another in December. In 5 days I was walking outside with the help of a walker. In 5 weeks I was back volunteering at Brandon Hospital. Dr. Miranda and his team were excellent! Thank you Dr. Miranda! Dr. Miranda saved my mother’s life. She fell and broke her hip in Puerto Rico. She had three hip reconstruction surgeries in Puerto Rico. My mom is a diabetic and immediately following surgery caught an infection and had pneumonia. Within 7 months she was withering away completely bed ridden. She had lost most of her muscle mass in her leg and had lost more than 50 pounds. I finally got her strong enough to travel to Florida where in less than a month Dr. Miranda assessed the problem and performed surgery. He immediately put in a port to dispense antibiotics to fight the infection that still lingered in her body. He then made sure that she was placed in an appropriate rehabilitation facility to help her walk again. Today, 7 months post-surgery she is walking and back at home living independently. Thank you Dr. Miranda and Amanda for all your help! I just wanted to personally thank Dr. Miranda and express my deepest appreciation for the truly OUTSTANDING job you did with my full knee replacement on February 11, 2014! As a direct result, I was able to complete my 54th Marathon (24th Marine Marathon) on October 26, 2014. I owe it all to you and FOI! I could not be happier or more relieved with my choice to visit FOI. After years of hip and leg pain, and knowing I would need a total hip replacement as some point due to a childhood injury, I’m so grateful to have learned of FOI and the highly skilled staff there. Dr. Miranda performed my THR on a Tuesday morning and I was up walking and back home the very next night. While this is probably not typical, I’m very thrilled that this was the case for me. Six weeks later and I’m headed back to work, getting stronger and better each and every day. 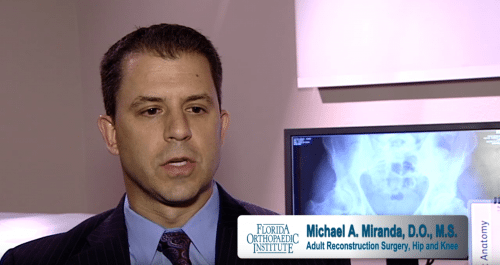 Thank you Dr. Miranda and Florida Orthopaedic Institute! I normally do not provide feedback. In fact, I was not the patient–it was my 77 (going on 40) year old mother. But it was because of my parents’ experience that I felt compelled to provide feedback. My mother needed a knee replacement after having been scoped at another institution. Given my personal past success with a few surgeons from Florida Orthopedic Institute, I selected a name from the list of knee surgeons, passed it along to my mother, and the rest is history. Dr. Miranda not only did a phenomenal job with the surgery (I would have been disappointed with anything other than a stellar performance from a Florida Ortho surgeon), he was a standout for another reason . . . he didn’t treat my parents (my father is 83-going-on-40 and attended all the appointments) like they were “old people”. My parents were given adequate time to communicate and Dr. Miranda “listened”. In doing so, he not only gained their genuine trust and respect, he was able to quickly and proficiently address my mother’s exact needs and get her on the path to almost a full recovery only three weeks after surgery. Kudos to Dr. Miranda in doing his job in a stellar manner while never forgetting that the simple act of listening is such a precious commodity. Dr. Miranda performed my knee replacement on May 21, 2013. With lots of hard work on my part in rehab, I was walking without any kind of assistance in 16 days, and my scar was hardly noticeable, thanks to Dr. Miranda’s excellent surgical skills! I must comment on his delightful staff, always so friendly and helpful, particularly Amanda who was available when I needed to have an answer to a troubling question or problem. Dr. Miranda is so easy to talk to and so understanding and listens to you —- treats you like a person, not a chart, wonderful bedside manner. Wonderful experience, and if my other knee should need replacing or a hip, I’d be right back in Dr. Miranda’s office! Florida Doctor First to Perform CT-Free, Robotic Orthopedic Surgery Using Implant New to U.S.
Florida Orthopaedic Institute Completes 20th Robotic Partial Knee Replacement and without a CT Scan.